Enjoy the popular traditional look in your bathroom with this beautiful vanity. Its beautiful beige tan marble counter and white solid wood base bring a great new look into your bathroom. Its double-door cabinet and drawers have lots of room to keep all of your bathroom items. Redo the style of your bathroom with this classic from Wyndham Collection. Add this vanity to your bathroom for more traditional style in your home. With a white marble counter and white solid wood base, this product is good-looking and useful. With drawer and single-door cabinet, this vanity set is also great to keep items in. Put a nice touch on your bathroom's look with this vanity set from Wyndham Collection. Acclaim 36-inch W 5-Drawer 2-Door Vanity in White With Marble Top in Beige Tan With Mirror Enjoy the popular traditional look in your bathroom with this beautiful vanity. Its beautiful beige tan marble counter and white solid wood base bring a great new look into your bathroom. Its double-door cabinet and drawers have lots of room to keep all of your bathroom items. Redo the style of your bathroom with this classic from Wyndham Collection. 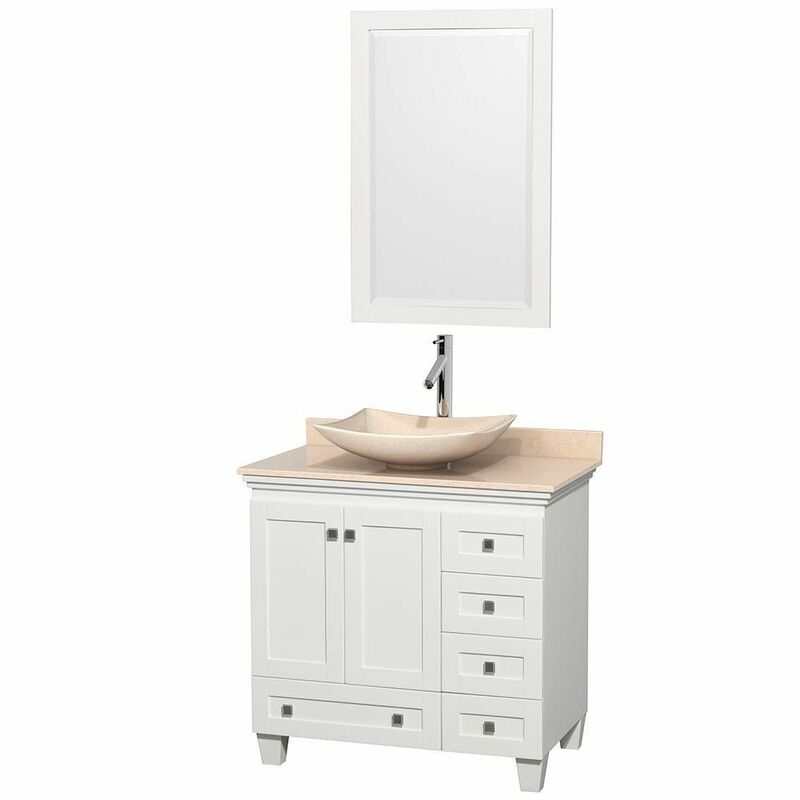 Acclaim 36-inch W 5-Drawer 2-Door Vanity in White With Marble Top in Beige Tan With Mirror is rated 5.0 out of 5 by 1. Rated 5 out of 5 by SeaIsleSam from Beautiful piece, well constructed, quite heavy. Arrived in perfect condition. Marble top is bea... Beautiful piece, well constructed, quite heavy. Arrived in perfect condition. Marble top is beautiful as is the vessel sink. Worth paying for white glove delivery.